For years I’ve been tolerating the same problems with my apartment. Now someone else would move out but my options are limited with a fixed income, no big bank account, no car. Also this location is convenient, a short walk to downtown and also on the bus route if I need to travel some distance. Recently I had to spend a few days outside the city at a motel in a semi-civilized area. There was more for me to do downtown, places I could go and hang out like the library, but to get to downtown that was a one hour – two mile walk usually in the energy-sapping heat. And the motel location wasn’t a good spot to catch a bus. My landlord didn't mention he would reimburse me for travel (taxi cab) and meal expenses outside those I could make at home (apartment kitchen was unusable). (Yes, I kept all my receipts for my out of pocket expenses.) I made sure that he was paying for the motel room. The motel was OK, standard. At home I don't have cable TV, just OTA (off the air) channels, but that selection is better than the motel cable channels. I'm not into seeing someone on the hunting channel shooting a pheasant with an arrow. The wounded animal is flipped up on its back, legs twitching in the air, while the Great Nimrod smiles. The motel cable selection did include the Syfy channel. This channel was once called Sci Fi but they had to get cool and artsy and call it Syfy even thought it still shows the same low budget crap. I don't pronounce Syfy as sci-fi but as sif-ee like in syphilis. 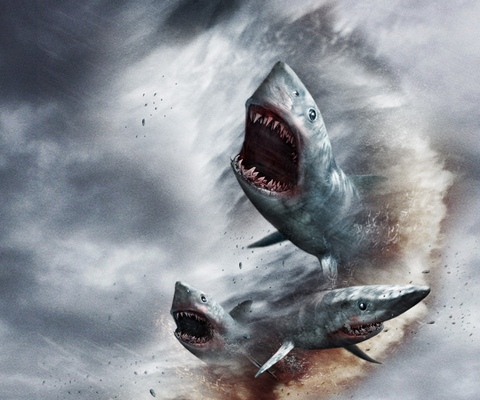 Of course I'm stuck with the one weekend when Syfy was foisting a Sharknado movie marathon. For those of you not blessed with such knowledge sharknado – shark tornado – is a sci fi concept with freak storms picking up hungry sharks and dropping them on land where they attack and eat people. The other variation is flying sharks ripping off body parts while zipping by. There are four movies based on this premise. Such potential for variety. How did just four movies cover all the possibilities? Usually I enjoy bad movies, amused by their outrageousness, but with my situation I wasn't in the mood. To take a break from such entertainment abnormality I made sure each morning to go downstairs for the complimentary breakfast. I would sit at one table by myself, alone. Around me were summer vacationers, couples and families. People with traditional lives. Over at his fanzine, Fadeaway, Robert Jennings has mentioned the problem of Too Much Stuff. TMS occurs when various items pile up but these items have some value, it's not easy to just toss them out. In Richard's case he is not only a SF/fantasy/OTR fan but also a dealer. I'm just a fan and while I haven't accumulated the mass Richard has I still have a surfeit of stuff. This is one reason why I haven't moved away from this apartment after suffering through the same problems for decades. The problems would be fixed – or so it appeared – and I avoided another Big Move. Other people have commented Plattsburgh, NY apartments compared to those in other places are overpriced. Someone who moved here – and is now leaving – told me that he was upset that he was paying $500 a month for a place that included fleas. He had to spend more even though he didn't need a lot of space and lived alone. But it looks like I'm going to have to move albeit while staying in the city. No notice yet from the landlord but I expect my marching orders when he hears that I filed a complaint with the building inspector's office. Of course I'm in the right – I can document the details – but being in the right and having facts on your side means nothing when you're dealing with a system built upon he Golden Rule: He with the gold makes the rules. For decades I've been stuck in the classic fight-or-flight situation with this apartment. After getting crapped on once too often I've decide to fight. So I'm faced with another apartment search in Plattsburgh, NY. The last time it was so enjoyable. I called phone numbers listed in the classifieds. One woman refused to rent to me because she only rented to females. Another man refused to rent to me because I was single. His “justification” was that single couples didn't stay long but married couples did. Discrimination? Of course. But do you fight it and have a good chance of winning? Don't forget the Golden Rule. Besides uploading this zine to efanzines.com I also send it out via email to subscribers through the TinyLetter newsletter service. I emailed TL about the matter. I heard back my newsletter/zine was OK and I could send my latest edition. Curious about the problem I asked what was flagged as being so bad. But I never got a response from TL. I suspect it might have been the image I used to illustrate my piece, Attack Of The Blood Bay Lamprey Zombies. The image depicted surface garbage in the notoriously polluted bay in Rio, Brazil where the Olympics are being held. In the foreground there was a plastic baby doll floating in the water, broken. Maybe Omnivore jumped to a conclusion, thinking I was using the image of actual baby parts floating in the bay. Omnivore should be put on a diet. It should stick to veggies and skip the meat.